DWARF (debugging with attributed record formats) is a debugging file format used by many compilers and debuggers to support source-level debugging. It is the format of debugging information within an object file. The DWARF description of a program is a tree structure where each node can have children or siblings. The nodes might represent types, variables, or functions. DWARF uses a series of debugging information entries (DIEs) to define a low-level representation of a source program. Each debugging information entry consists of an identifying tag and a series of attributes. An entry or group of entries together, provides a description of a corresponding entity in the source program. The tag specifies the class to which an entry belongs and the attributes define the specific characteristics of the entry. The .debug_abbrev section contains the abbreviation tables for all the compilation units that are DWARF compiled. The abbreviations table for a single compilation unit consists of a series of abbreviation declarations. Each declaration specifies the tag and attributes for a particular debugging information entry. The appropriate entry in the abbreviations table guides the interpretation of the information contained directly in the .debug_info section. The .debug_info section contains the raw information regarding the symbols. Each compilation unit is associated with a particular abbreviation table, but multiple compilation units can share the same table. There are licensed tools, such as readelf, dwarfdump,_and_libdwarf available to read DWARF information. A script or program can read the output of these tools to find and interpret the required information. It is important to know tags and attribute definitions to write such scripts. The following list shows the tags that are mostly of interest when debugging a C++ application. The following command is used to compile a program in the DWARF format using the XLC compiler. The dwarfdump output of the above example can be interpreted in the following way. The .debug_abbrev section for DW_TAG_compile_unit looks as shown in Figure 2. DW_TAG_* is generally followed by DW_CHILDREN_* and a series of attributes (DW_AT_*) along with the (DW_FORM_*)format.DW_CHILDREN_* is a 1-byte value that determines whether a debugging information entry using this abbreviation has child entries. If the value is DW_CHILDREN_yes, the next physically succeeding entry of any debugging information entry using this abbreviation is the first child of that entry. If the 1-byte value following the abbreviation’s tag encoding is DW_CHILDREN_no, the next physically succeeding entry of any debugging information entry using this abbreviation is a sibling of that entry. Each chain of sibling entries is terminated by a null entry. The DW_FORM_* attribute specifies the way to read DW_AT* in the.debug_infosection. In this case, DW_AT_name is of the form string. So the first attribute of DW_TAG_compile_unit has to be handled as a string in the .debug_info section, which is test.C. The file type is C_plus_plus and it is present at /home/raji. The file is compiled using IBM XL C/C++ v12. There is a data type, named int and its size is 4 bytes. There is a class, named base and its size is 4 bytes and its sibling entry is at location <126>. There is a class member, named basemember. The type of this member is at location <82>, which is int. The scope is public and it is present at the 0th location from the starting of the class. 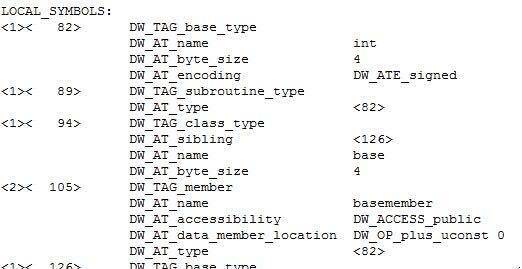 The immediate child of DW_TAG_array_type is DW_TAG_subrange_type, which has the array size. Array size is calculated as (DW_AT_upper_bound– DW_AT_lower_bound) +1. If it is a two-dimensional array, there will be an immediate sibling of type DW_TAG_subrange_type again. In this case, the array size is 8 (7+1). There is a function, named display, and its scope is public and its sibling is located at <332>. The mangled name is display__7myclassFi. The first argument to the function is this. It is created by the compiler as DW_AT_artificial and is set to yes and the type is at location <421>, which is myclass. The second argument name is x and the type is at location <82>, which is int. DW_TAG_typedef represents the typedef name and type information. From Figure 8, we can understand that there is a typedef entry named int_type and its type is at location <82>, which is int. 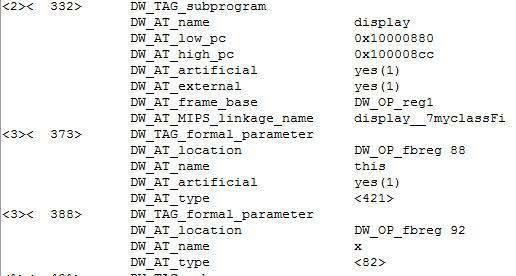 DW_TAG_enumeration_type has the enum name and DW_TAG_enumerator represents its elements’ information. DW_AT_const_value specifies the values assigned to the elements. 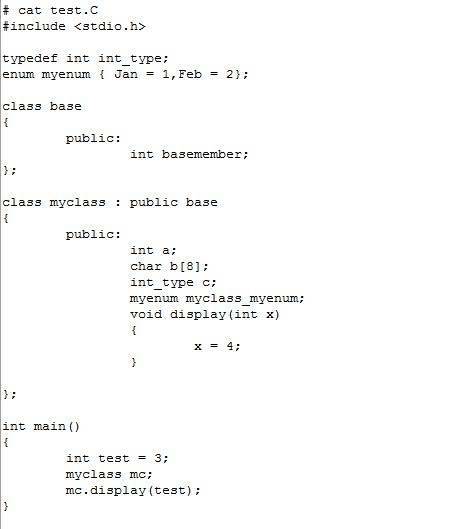 myenum is the name of the enum and its size is 4 bytes. Jan is the first element and its value is 1. Feb is the second element and its value is 2. DW_TAG_inheritancerepresents the inherited class name and type information. There is a derived class named, myclass, and its size is 24 bytes. The base class is at location <94>, and is named base. The DW_VIRTUALITY_none attribute specifies it as a non-virtual class.